Facebook Messenger New Emojis including Females Professionals and Redheads: Just Now, Facebook-owned company, Messenger posted their Emoji update on Facebook Messenger Page with long Post as given bellow. This new update has included with new skin tone and gender options. Now, you will be able to pick from the five other skin tones in this new Messenger Emoji like WhatsApp Emoji which has approved by the Unicode Consortium. Messenger Emoji Update representing the professionals like the police officer, swimmer, or surfer will also be available in a female version. You can also change the hair color by using hair color option from pick red hair color and also for the skin tones, you can change it every time or keep it as default yellow color. The official Messenger Facebook Post says bellow quotations along with the hashtag of #MessengerEmoji. From skin tones that you can choose to lots of women in great roles, Messenger is beginning to make emojis more representative of the world we live in. Emojis have changed the way we talk to each other – whether it’s a smiley face to show you’re happy, a thumbs up, or a pizza when hungry, emojis are a fun, easy way to express yourself when words just aren’t enough — and people love them! In fact, nearly 10% of mobile sends in Messenger include emojis. However, not all platforms have kept up with emoji standards as they’ve evolved – which means sometimes the emoji you wanted to send wasn’t the one that showed up. Nor are they living up to the gender and skin tone diversity that we see in our world everyday. Messenger is addressing emoji woes by rolling out a new set of standardized emojis so you can be sure you’re sending the right message. No matter what emoji you pick, it will now look the same for all Messenger users, regardless if the recipient is on Android, iOS or another platform. In other words, no more broken-looking black boxes or emojis that just don’t make sense. Our characters are consistent every time you use them, no matter what platform the recipient is on. Messenger is bringing over 1,500 newly designed Messenger emojis to the world. The new designs, gender-agnostic options and multi-colored emojis will be available on many Android devices and web products for the first time. We’re diversifying the genders to create a more balanced mix that’s more representative of our world. Now, using Messenger emojis, you’ll see a female police officer, runner, pedestrian, surfer and swimmer for the very first time, and we’ll keep rolling these out. In an effort to make the emojis you send a better representation of our world, you will also be able to pick the skin color you prefer. All you have to do is set the color you want your default emojis to be when Messenger launches, and your emojis after that will follow your preference. Of course, you’ll have the option to change this in settings or even make a one time decision. Also, at launch, we have emojis representing red heads for the first time. On all platforms, the Messenger composer will now include an emoji picker to help you select the perfect emoji. Tap the new emoji icon at the left of the composer to find just the right emoji. It’s now easier than ever to toggle in between the regular text keyboard and the emoji keyboard. 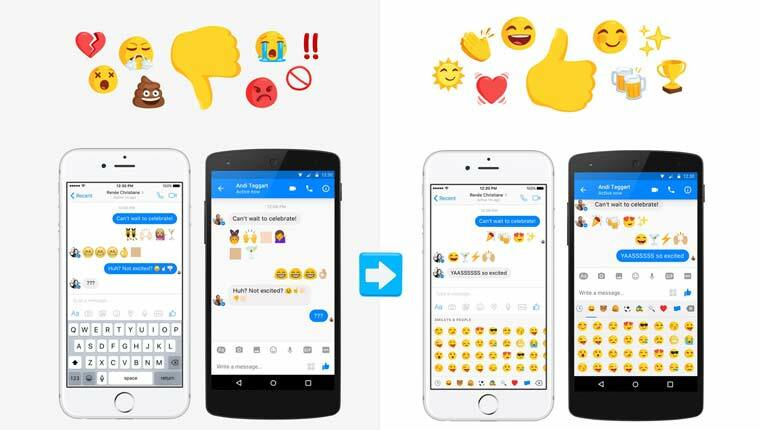 The Facebook Messenger New Emojis will push the Messaging App into another stage when compare to their own compatitor, WhatsApp.